My grandmother is one of those people who get excited about cooking even at her age of seventy-eight. Cooking for her family and loved ones have occupied most of her time, all her life. As a young girl she cooked for her five brothers and two sisters, as a young wife she cooked for her many brothers-in law and sisters-in law apart from her immediate family and she makes amazing delicacies for those dearest to her, her grandchildren. Ajji specially loves making pickles and she has an impressive list of absolutely delectable recipes that she makes all through the year. She adds all her ingredients by instinct based on her experience and vast knowledge. They can be subtle with spicy, sweet and sour accents or deliciously fiery making your mouth and eyes water at the same time. Her pickles can be elaborate with laborious procedures like the raw mango pickle and lemon pickle, which are usually made once a year when mangoes and lemons are in season. At other times, she makes instant pickles with vegetables like cauliflower, carrots, stringed beans, beetroot and bitter gourd. It would not be an exaggeration to state that she can practically turn any vegetable or fruit into lip smacking pickles. 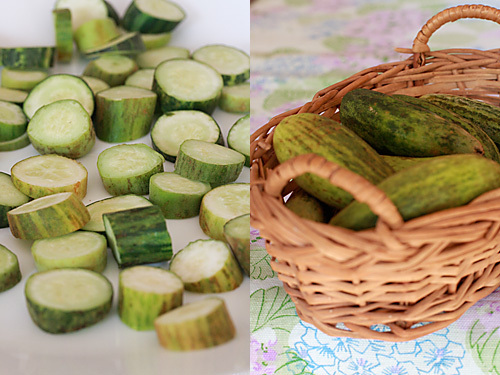 Take this cucumber pickle for example. I could have very well named it vegetable pickle as you can replace practically any raw vegetable with the cucumber. A good pickle can brighten any dull meal. It can add spice to a simple meal of dal and rice or be the much needed accompaniment to the classic Indian curd rice. A meal of curd rice with mango pickle is my absolute favorite that has continued to be so through the years. With my grandmother's instant pickle recipe, pickle making need not be time consuming any more. 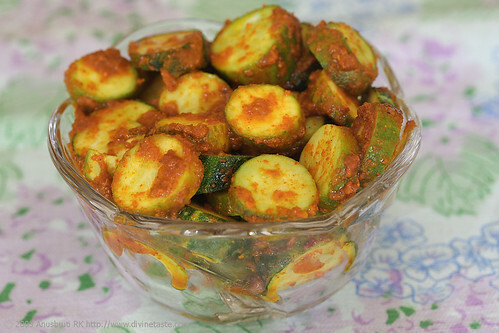 You will love how this pickle comes together in an instant with commonly used spices in Indian cooking. You can use any vegetable like carrot, beetroot, cauliflower, tomato or bitter gourd. A combination of two or three vegetables can also be used. Slice the cucumber and mix with all the ingredients. Can be kept refrigerated for a week. Thats nice one, never made cucumber pickle in this way! the same way you can make pickles out of almost any vegetables like chow chow.if chopped into small pieces it will be ready in 30 minutes. Could you please share some recipe for carrot ,turnip, caulifower pickels without sugar..
K G Bhat: I'm sure chow chow pickle will taste wonderful. Shweta: You can use the same recipe and replace the cucumber with carrot, turnip and cauliflower either individually or in combination. You can substitute the sugar with a more natural sweetener like jaggery, maple syrup or agave nectar or leave it out altogether. 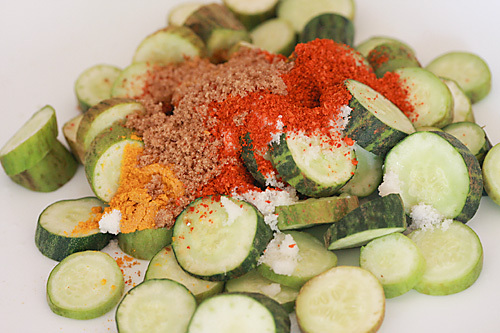 Your post on Instant Cucumber Pickle " divinetaste was interesting…. I tried this recipe & my family loved it! It was super yummy!